At critical bolted connections regular maintenance is required. The bolt must be tight tightened at the same torque as all other bolts for maximal strength of the connection. Definitively, the weakest link determines the strength of the complete connection. However, critical bolted connections can be liable to vibrations or temperature fluctuations which can cause the bolt load to decrease and deviate from the other bolts. When the bolt load has decreased too much, the connection is not strong enough anymore so incidents can happen, like a bridge collapse. With the BoltSafe system you can monitor simply and easily your bolted connections. 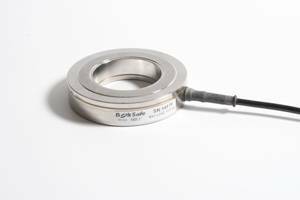 The BoltSafe washers measure the bolt load and transfer the data by cable to the Power Data Interface-New Technology (PDI-NT). The PDI-NT is a connection box for interfacing the BoltSafe network. The box can be adjusted so that it gives an alarm signal if the required bolt load becomes too low in a bolted connection. In this way, the possibility of a weak bolted connection can be prevented. How does the BoltSafe system work? Place a BoltSafe washer between the nut/bolt head and the flange surface, and measure with the PDI-NT the actual bolt load during the assembly. This way the correct residual bolt load bolted joint is ensured. After assembly, the actual bolt load can be monitored so under/overload and expensive check ups can be avoided.